The Implementer Group has called on the members of the Global Fund partnership, especially donor constituencies, to urgently follow the example set by Japan and contribute funding through the existing procurement mechanism – i.e. the Strategic Fund of the Pan American Health Organization (PAHO) – to provide aid to the people affected by the unprecedented humanitarian and health emergency in Venezuela. The Implementer Group also called on the Global Fund to continue exploring concrete mechanisms to support efforts to address this unprecedented health crisis, and to develop a more proactive and effective approach to countries in crisis. The Implementer Group issued a statement to this effect during the Global Fund Board meeting in Geneva on 14-15 November. In its statement, the Implementer Group also called on the international community to channel resources to Venezuelan civil society to enable it to continue monitoring the situation, and also to distribute medications and other commodities. “We will hold the international community accountable and responsible for the price of inaction by ignoring and not responding to this humanitarian crisis,” the statement said. “Since then, not much has happened, the statement from the Implementer Group said. On 13 November, the pre-meeting day at the Board meeting, there was a round table on the situation in Venezuela. According to the statement from the Implementer Group, at the round table PAHO reported that TB incidence is on the rise in Venezuela; and that there is a scarcity of basic TB diagnostics, a scarcity of drugs, and an increased incidence in HIV/TB mortality. Representatives from PAHO said that the organization has been providing credits for procurement of HIV, TB and malaria commodities to Venezuela – the last valued at $2.3 million. However, PAHO said, it has been difficult to continue with credits given that the Venezuelan government has yet to repay PAHO several million dollars for credits obtained previously. The Implementer Group said that while it was finalizing its statement, Standard & Poor’s has declared that Venezuela has defaulted on debt valued at $60 billion, having failed to pay $200 million in interest. “This will undoubtedly worsen the economic situation of Venezuela,” the statement said. Although there was a round table discussion on the pre-meeting day, no discussion of the situation in Venzuela was included on the agenda of the Board meeting itself. 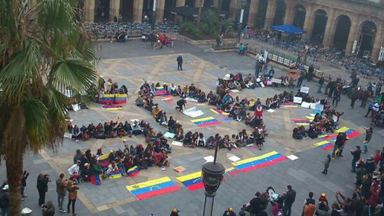 Aidspan’s most recent GFO article on the situation in Venezuela can be found here. See also separate article in this issue on potential changes to the Global Fund’s Eligibility Policy.